The illustrious career of Susan George began at an early age. By the time she was 12 she had already filmed the same number of television plays and many more commercials. Throughout the seventies /eighties her face was rarely away from British television screens and at just 17, she won her first starring film role opposite Michael York in The Strange Affair. In 1972, she landed what was to become her most iconic film role, starring opposite Dustin Hoffman in Sam Peckinpah’s Straw Dogs. Susan’s performance as Amy, Hoffman’s young wife, was revered worldwide and catapulted her to International stardom. Living in California for some 12 years she starred in many movies before her return to the United Kingdom in the eighties to set up Amy International Productions. Choosing to work behind the cameras, in partnership with her late husband and fellow actor, Simon MacCorkindale. Although Susan George is known the world over for her international film career, in the Middle East she is known for another passion, that of breeding the pure bred Arabian horse. Her stud farm Georgian Arabians is based in The West Country of England and began as a hobby some 24 years ago. However, it has since become a successful business enterprise and in residence now are notably some of the world’s finest purebred Arabian Horses bred by Susan George. It was a project, shared with Simon and realized after years of dedication and commitment. In 2010 when Susan’s husband lost his battle with cancer, life took on a very different meaning and her aim in recent years to ensure the outcome and success of the many projects and plans that they had created and begun together. Some years ago Susan unveiled a new talent for photography and her ability to capture the beauty and spirit of the horse has been realized in a highly acclaimed exhibition of work entitled, The Spirit Of Equus. Her photographs have been described by art enthusiasts as “unique and breath- taking.” First staged at Petley Fine Art in the West End of London The Spirit of Equus was last exhibited in Harrods. 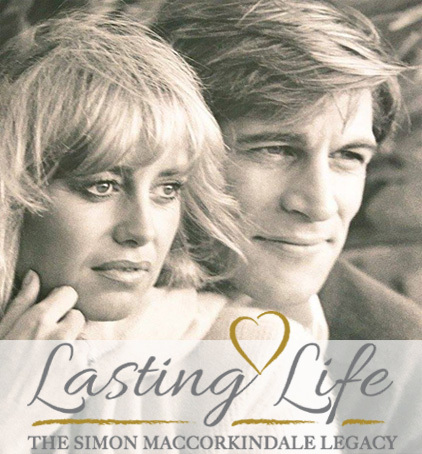 In 2016 Susan saw the realisation of a project closest to her heart the launch of “Lasting Life the Simon MacCorkindale Legacy” The charities mission is to help and support those living with the cruel disease of cancer in any way possible to bring hope and a smile at a time of need. The flagship fundraiser “Lasting Life Love Letters” took place in November 2018 an evening where special read letters of love and poetry and musicians filled the air with personal dedications of music and song. The aim of Lasting Life is to fundraise and see monies actually handed to those living with cancer whereby we are able to make a difference. Exciting plans for 2019 are to complete her in progress autobiography that has seen dramatic change in shape and content over recent years, hence its lengthy delay but now she feels the timing couldn’t be more right to publish. To see the growth of the charity so close to her heart lastinglife.org.uk and continue her philanthropic work raising funds to help those living with the cruel disease of cancer. The hit BBC television series “The Real Marigold Hotel” premiered in 2018 and Susan’s supporters and fans world wide, welcomed her long awaited return to the screen. She has recently signed with new agents in the UK and US and an array of offers are already at her door. There is undoubtedly palpable excitement in the Susan George camp, for the ambitious goals she has set for herself and those around her in the coming year but those close to her, know how positively and tenaciously she will work to realise. SUSAN GEORGE IS A MEMBER BRITISH ACTORS EQUITY; THE PERFORMING RIGHTS SOCIETY; BRITISH ACADEMY OF COMPOSERS AND SONGWRITERS; SCREEN ACTORS GUILD; THE AMERICAN FEDERATION OF TELEVISION & RADIO ARTISTS; THE ALLIANCE OF CANADIAN CINEMA, TELEVISION & RADIO ARTISTS; She is a LIFE MEMBER of THE ACADEMY OF MOTION PICTURES ARTS AND SCIENCES, and also of THE BRITISH ACADEMY OF FILM AND TELEVISION ARTS. She is a Past President of the BRITISH ARAB HORSE SOCIETY and PAST HONORARY PRESIDENT of The Horse of the Year Show. She is included in the BOOK OF LISTS, WHO’S WHO and DEBRETTS.